A solo, self-supported 6242 kilometre sea kayak journey, to every one of the 192 R.N.L.I. Lifeboat Stations around England, the Channel Islands, Wales, Ireland and the Isle of Man. Raise funds for the Royal National Lifeboat Institution (R.N.L.I.) and a general awareness of the invaluable service they provide. Raise awareness about mental health and the prevention of suicide. The banner image above was taken in 2015, in the closing hour of my four month, 2960km solo kayak journey, when I successfully visited every one of Scotland’s R.N.L.I. Lifeboat stations. I was approaching Eyemouth which was where the 47th, and final Scottish Lifeboat was berthed. As I paddled slowly towards the distant harbour entrance in a lumpy east-coast swell, my mind was awash with emotions. After four months of expeditionary sea kayaking, I was pleased that the journey was coming to a successful conclusion and I was looking forward to returning home. However I was aware too, that I wanted my adventure to continue. It felt that my quest was incomplete because there were the rest of the British and Irish R.N.L.I. Lifeboat stations to visit. The sense of incompleteness has remained with me ever since. In March 2019, I will continue my solo R.N.L.I. kayak journey. I will set off from Eyemouth (south east Scotland) where I completed my 2015 expedition, to complete what has remained unfinished business since then. Ahead of me will be 192 R.N.L.I. Lifeboat stations, a kayaking distance of 6242 km (3901 miles) and undoubtedly an incredibly rich adventure. The planning for this journey is ongoing. There is much for me to research about the route and to learn. You can read more about my proposed route - here. I’m confident that I can complete the venture within eight months, though as always, I’ll be at the mercy of the weather. This is an ambitious undertaking and I’m under no illusions as to the enormity of the challenge. I’m a seasoned and highly experienced solo expeditionary sea kayaker, so I understand my potential and I’m clear about my limitations. This journey will be my longest and furthest in time and distance to date. I’m sure it will be testing for me in many different ways, though in many respects, the potential demands of the challenge are a strong attraction. Safety, as ever, will be a key focus in my planning and the execution of the venture. You can read about my safety considerations - here. A Helping Hand, Tobermory Lifeboat. Since my 2015 journey, I have become even more closely acquainted with the R.N.L.I. I am on the fundraising committee for the Tobermory Lifeboat and I’m also one of the Deputy Launch Authorities (DLA) for the station. 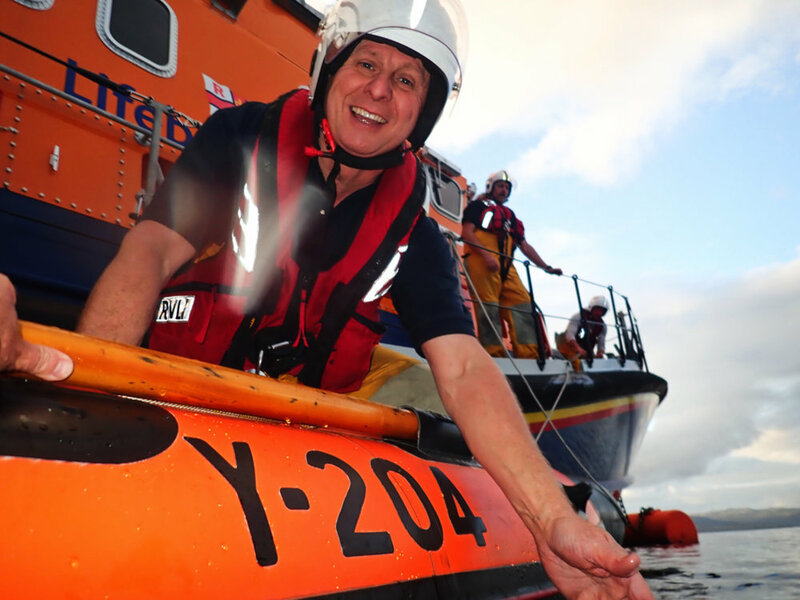 As my relationship with the charity has deepened, so has my respect for the service they provide, not only through acts of life saving courage but also the importance they place on education and raising awareness about coastal safety. The charity is independent of government support and relies totally on raising funds through donations, bequests and fundraising to operate. In 2017 it cost £177.3M to run the lifesaving service. Details of these running costs can be found by following this link - here. I raised just over £5000 for the R.N.L.I. in 2015 and subsequently £2000 in 2017. I have not set a funding target for 2019, but I hope to certainly match those combined amounts. I will set up an online donations page early in 2019. A deeply personal thread which will be woven throughout this expedition, is the one of my struggle with clinical depression and my battle against suicidal desires. You can read more about my life with mental ill health in my blog on this website - here. Through my difficult personal experiences with my depression, I have come to realise that despite the dark depths I may feel I sink to, these times of desperation will not last forever. It’s in these moments when completing suicide may seem like a desirable option. It’s holding onto the truth that suicide is a permanent solution to an impermanent emotional state. I will raise awareness about these important mental health issues through my openness and candour about my personal experiences, what I have learned from these and how I choose to live my life. It’s my hope that I offer inspiration through this approach and even better, if I engage in dialogue with folks about this during my journey around the coast. They now have a Shannon class lifeboat. The most northerly R.N.L.I. Lifeboat Station in Britain. They now have a purpose built station. They were the first Scottish station to receive the Shannon Class lifeboat. It arrived a few days before I did. The only slip launched lifeboat in Scotland. St Abbs was decommissioned as an R.N.L.I. lifeboat two days after my visit. It is now an independent lifeboat.